I had a bad day recently and what I really wanted to do was inhale a pan of brownies, but I had just published a post about how I beat a sugar addiction and I didn’t want to be a healthy hypocrite. 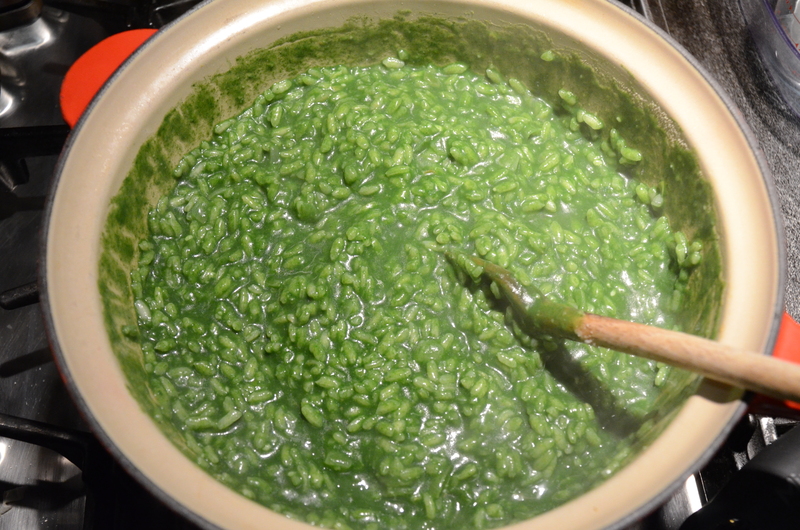 Instead I set out to make a pot of spinach risotto, my culinary equivalent to a big hug. If you’re not a spinach fan, I’m not going to be much fun for you this week and next. We are on the verge of spring, Nature’s new year. I really feel the resurgence of energy and life that comes back in spring and I get so motivated to start fresh, clean a closet, reorganize a drawer, set some healthful resolutions. Nutritionally speaking, Nature wants us to start fresh, too, so she gives us lots of dark leafy greens like spinach. If winter added a few pounds or you have a build-up of mucus or stagnant energy, leafy greens can help. You already know that greens are super nutrient-dense, but it’s all that chlorophyll that helps the liver to detoxify. Now if you’re in a habit of eating seasonally, you don’t even need to know this since you would make it happen naturally. As I mentioned in my Spinach and Avocado Smoothie recipe, you have a fantastic window of opportunity with St. Patrick’s Day coming up to make green food. So I thought today would be a great time to post this spinach risotto recipe. Please don’t get put off by the word “risotto.” It doesn’t imply something hard to make, easy to screw up or super labor intensive. In fact, risotto is something I make when I don’t have a lot of time or I need to make do with bits of this or that in the fridge. This time around I was overzealous with my purchase of spinach and wanted to find a good place for it. Risotto is often served as a first course for dinner, but we’re not in a habit of eating dinner in courses at our house, are you? So I serve it as a side with other dishes that are a little lighter. The night I photographed this, I served it with roasted shrimp and a green salad. I very often serve fish with risotto, such as spice-rubbed or poached salmon with a fresh tomato salsa. Steamed asparagus, roasted carrots or a grated carrot salad would also complement nicely. If you do think you will serve this as part of a St. Patrick’s Day dinner, why not give everybody a jump start on spring cleaning and serve everything green? Enjoy! 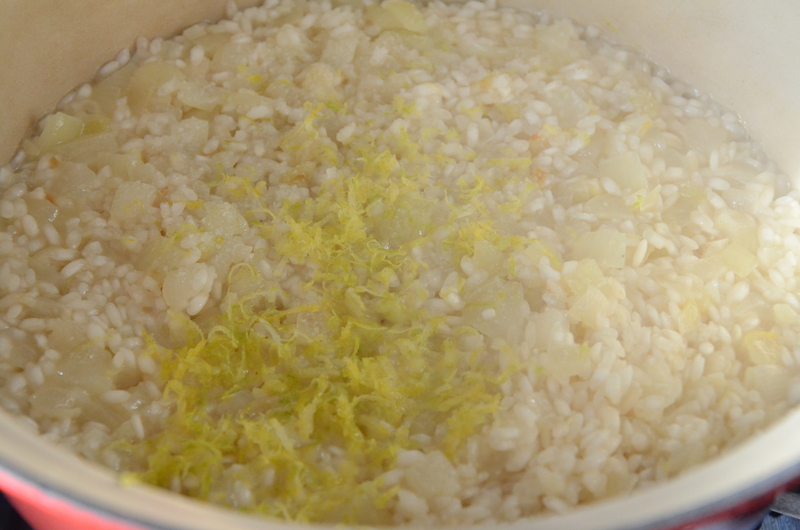 In a wide saucepan you will use for the risotto, bring ½ an inch of water to a boil. Add the spinach leaves and cover. Steam for one minute. Stir the spinach and continue to steam until just wilted. Transfer the spinach to a blender (I pull the spinach out with tongs) and discard the cooking liquid. Puree the spinach and set aside. In a medium saucepan, bring all the stock to a boil and turn off the heat. In the same saucepan that the spinach was cooked in, warm the olive oil over medium heat. Add the onion and sauté gently until tender and translucent, about 3-4 minutes. Add the garlic and sauté for another minute or two. Add the rice to the onions and stir to coat with the oil. Set your timer for 20 minutes. Sauté rice for 2 minutes. Pour the wine into the saucepan and stir occasionally until it has been absorbed. Add the salt, zest, and 1 cup of the warmed stock and bring to a lively simmer. The pot should be simmering with active, not furious bubbles. Once the stock has almost been fully absorbed, add another ladleful or about ½ cup and stir occasionally. After 20 minutes, taste the rice for doneness. Ideally, it is still al dente. 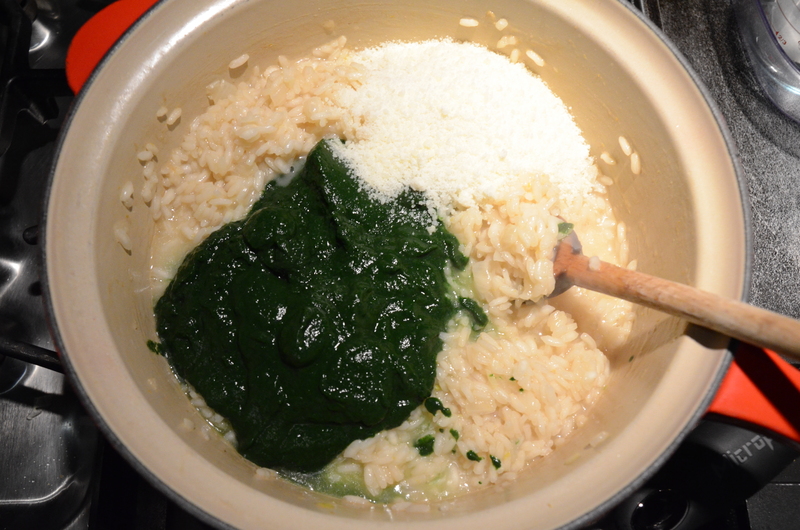 Stir in the cheese and spinach puree. Give the risotto a nice, brisk stir. Turn off the heat and allow to sit for 5 minutes. It should be loose and almost soupy. Serve immediately. 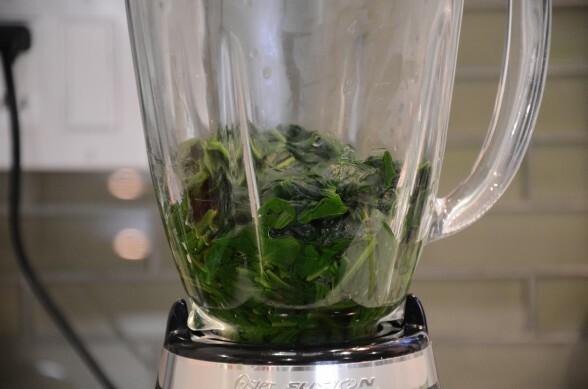 I didn’t have enough spinach, but I had kale and because I take your classes, I had the foresight to substitute kale and blend it with the spinach and pesto…it was delicious! I will definitely add this to my go tos. Nice job, Linleigh! I might have to try that version myself. You know how I am obsessed with kale! I am a huge risotto fan, I try to make it with vegetables whenever possible as I am trying to get my husband off the potatoes with every meal thing. We both loved this! Thanks for sharing!! Haha, good idea! Glad you both enjoyed it. Thanks! I have made something very similar, and used chicken broth, brown rice and asparagus..so lovely..
Have you tried barley in risotto? It’s very creamy! I have a recipe on the site for barley with artichokes and spinach — delish! I have never had/made risotto and I made this today! So great and the recipe was so easy to follow. How far in advance do you think you can make this…do you think it needs to be served right away like directions? I think I am going to make it for guest next weekend w/lemon chicken! I’m so glad you had success with this recipe. I absolutely love it! Unfortunately, risotto is tricky to prepare in advance. If you let it sit, it loses its creaminess and starts to thicken and firm up. If you need do part of this ahead, puree your spinach and saute your onions a few hours ahead and then start cooking the risotto just before you want to sit down. If you choose not to include the wine, do you need to make a substitution or just leave it out completely? Sometimes a little extra acidity is added (like lemon juice), but I wouldn’t add that in this recipe in the beginning because it will change the color of the risotto to an unattractive green. I would just skip it and then taste the risotto at the end. If it needs a little punch, just squeeze extra lemon to finish. 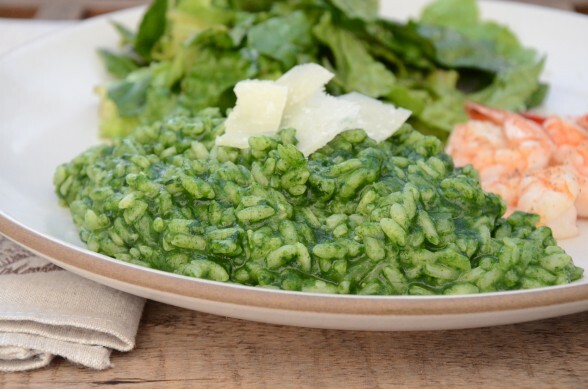 This spinach risotto was outstanding! I know it is “healthy” yet it seems so very rich. The combination of subtle but distinct flavors combines for a smooth taste experience. Have you tried this dish with other greens? Love the emerald green color! Good question! I haven’t tried this with other greens, although I would be hesitant to use the same amount of another, more assertive leafy green. 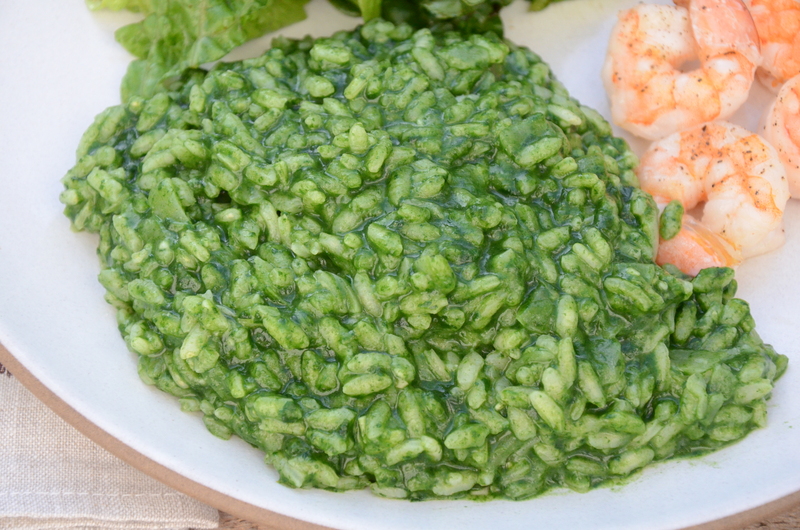 What I love about the spinach is that it doesn’t make the risotto taste spinach-y. Anything else might be overpowering, but who knows? Let me know if you try it with something else. This is the best spinach risotto we’ve had. Kid approved, which is important right now… and it is easy! Thanks Kathy! Happy St. Patty’s Day! I love the color! I can’t wait to try it! Do you press out the liquid from the spinach after cooking or is it fine just by using the tongs? I do a beet risotto that is just as bright, but is fuchsia! It would be fun to make both for a preppy pairing! Preppy pairing! That’s so fun! 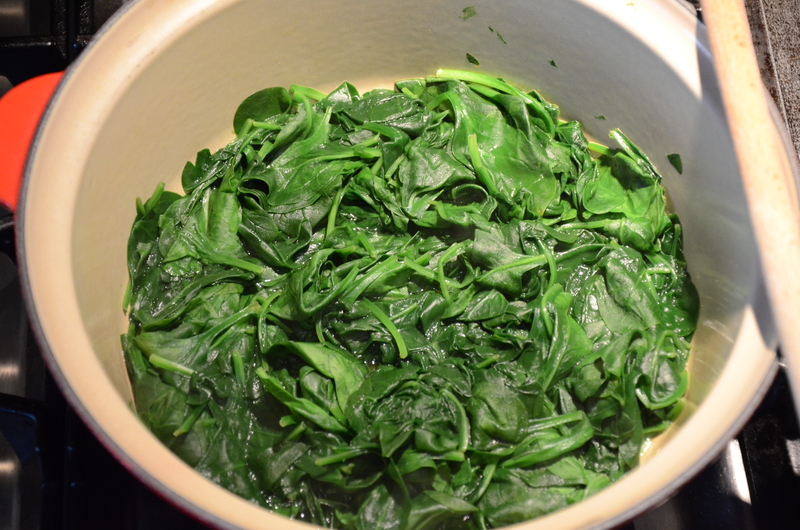 No need to press the liquid out, just pull the spinach out of the pot with tongs.